How to Create a Blog in 2018 & Make Money Online? If you’re here then I am sure that you are interested in making a long-term & stable income from home. A blog is the only thing that can give you all the freedom, money & time you need to enjoy the life you want. In this post, I am going to teach you how to create a blog & how to generate money from it(step-by-step). So, put yourself in a comfortable position and follow this step-by-step guide to create your first blog without any experience. Blogging is not a quick-rich method. After you start a blog, it will start generating money only after 1 – 5 months. And once it starts generating money then there will be no stopping because there is no limit on the amount you can earn from your blog. There are several bloggers who earn $1k – $100k+ in a single month from their blogs. If they can then you can do that too! 1: You don’t need to have any kind of coding knowledge. 2: You can grow your blog from anywhere you want. 3: A successful blog can be so powerful that you’ll not be needing any kind of job anymore. If you are ready to go then let’s create a blog now! Follow the below guide to build your first blog. If you have any doubts then you can directly contact me, I’ll be happy to help. And, don’t just read this content! Take Action now because if you delay then your dreams will only move farther & farther away from you. Delaying is really a bad habit. It is what that differentiates between successful & unsuccessful people. You always need to work hard to achieve success because “the only place where success comes before work is in the dictionary“. The first step is very important because you need to decide a niche(topic) for you blog. You can choose any niche in which you are interested. For example, you can create a blog on food, clothing, health & fitness, product reviews, science, news, movies reviews, etc.. Your blog can be about anything but only select a niche(topic) in which you are interested & have knowledge. Because if you choose a niche which is unknown to you then you will find it very hard to write content & at some point, you may lose your interest. Still thinking about what to choose? 1: About your interests & passion. 2: About the problems you can solve for others. 3: About all the things you know. I assume that you have decided the niche for your blog. So let’s move on to the next step. Now that you have decided in which niche your blog is gonna be, the next step is to choose a blogging platform. A Blogging platform can be considered as a tool that helps you to set up your blog easily. There are many blogging platforms such as WordPress, Blogger, Weebly, WIX, etc.. But WordPress is the most powerful & effective blogging platform on the internet. 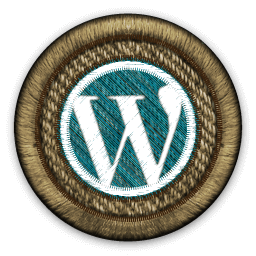 Because more than 60% of the blogs on the web run on WordPress. WordPress.com: Where your blog will be hosted by WordPress for free & you will be given a free domain name with .wordpress.com extension. + You will have limited access & flexibility. WordPress.org: Your blog will be self-hosted with the help of hosting providers and you will have full control of your blog. You will have your own domain name & a hosting service at a very cheap price. You can manipulate your blog the way you want. More user trust & more traffic from Google. You should choose self-hosted WordPress blog because you will have full flexibility & control of your blog at a very cheap price. You will not have full control of your blog. Your blog posts or complete blog may get deleted (I’ve experienced this with free blogging). You can’t make much money because many ad networks & affiliate programs will not approve your blog. There will be no user trust or brand. Google will not rank your blog higher. I guess you do not want a blog that has no user trust or brand, generates less traffic & can disappear anytime without any notice. Why would you need a free services when you can launch your complete blog for about $50 – $70 per year? Yes, for just $50 – $70 per year! I assume that you have decided to go with self-hosted WordPress blog. So let’s move on to the step 3. Let’s say, you want to construct a building. How to Choose a Better Hosting Service? Even this blog is hosted on SiteGround due to the above reasons. And the best part about SiteGround is that the prices are very affordable. You can host your blog on SiteGround for just $3.95 per month. Yes, it is that cheap! SiteGround also offers 30 days money-back guarantee so, you do not have to worry about anything. A quick question – Would you like to host your building(blog) on sand? No, right? 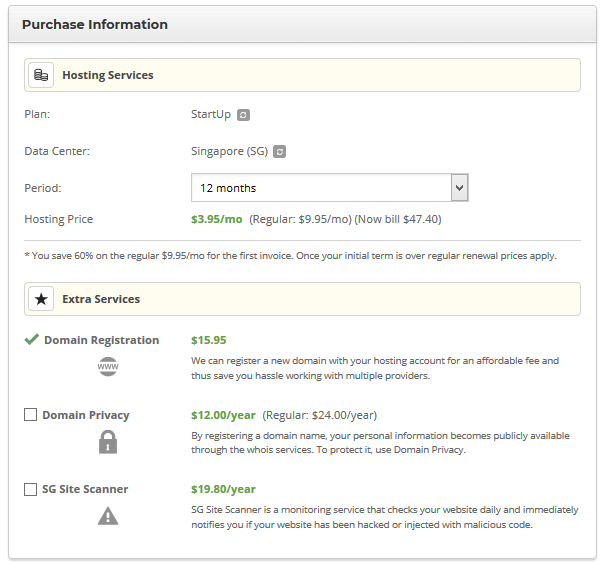 then only choose SiteGround to host your blog(building) on a solid (ground) hosting service. Click here to Join SiteGround. You will get 60% discount on the regular price for 1 year if you join SiteGround from the above link. After you click, you will see the following page. Now go through all of the plans and choose the right one that suits your needs. 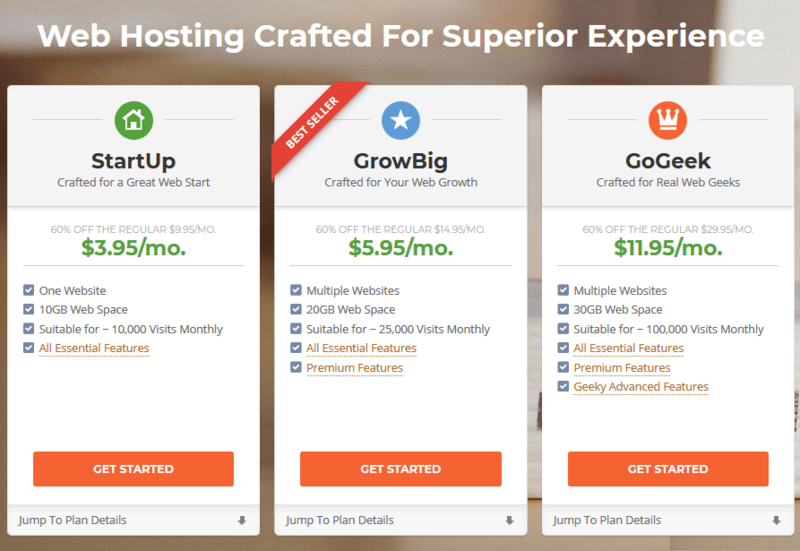 If you want to host just one website then choose “StartUp” plan else choose “GrowBig” to host unlimited websites. You can upgrade your hosting plan anythime you want. Just contact their customer service. Once you’ve decided which plan to choose then click on the “GET STARTED” button. The next step is the register a domain name for your site. After you click on the “GET STARTED” button, you will see the following page. A domain name is required to identify a website. Tip: Try to choose a domain name which is relevant to your niche. Also, make sure that your domain is catchy & is easy to remember. 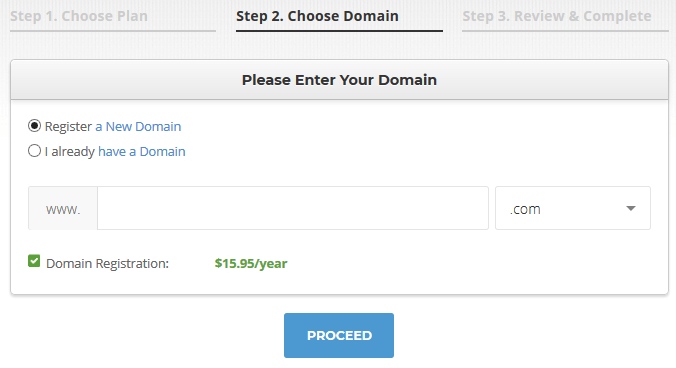 Option 2: If you already have a domain name then select “I already have a Domain” option and enter your domain name, click proceed. 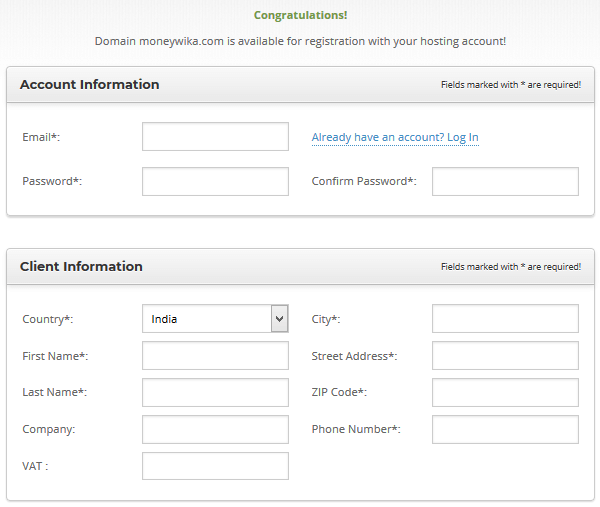 Option 1: If you do not have a domain name then select “Register a New Domain” and type your desired domain name. If your domain name is not available then try another one again & again until the domain name you’ve chosen is available. If it is available then you will be taken to the following page. Now you should enter your true details. The next step is to enter your payment information. If you have a credit card then enter your card details. SiteGround is not an Indian company so it won’t accept local debit cards & net banking services. So, if you’re an Indian and you don’t have a credit card then you can use your debit card from the following banks. Even if you have a debit card from the above banks, your card needs to be enabled for international transactions in order to work with SiteGround. You can enable international transactions for your debit card by calling the customer service of your bank (this process will take about 10 minutes). If you have your payment method ready then let’s move on to the next step. You don’t need to make any changes because the following services are not necessary for the beginners. Now scroll down, tick the agreement box and click on “PAY NOW” button. If the payment information you’ve entered is correct then you will be taken to the following page. Congratulations! now you have a hosting account where you can host your files. Now click on the “Proceed to Customer Area” button. Note: If you receive any emails from SiteGround asking for confirmation then confirm your email by clicking on the confirmation link you received. The next step is to install WordPress. Let’s do it! If you are already logged in to your SiteGround user area, then click on “My Accounts” tab. Now click on the red “Go to cPanel” button to view your cPanel area. If you see a pop up then click on the “Proceed” button. cPanel is where all your website files will be hosted + you will have many tools available. 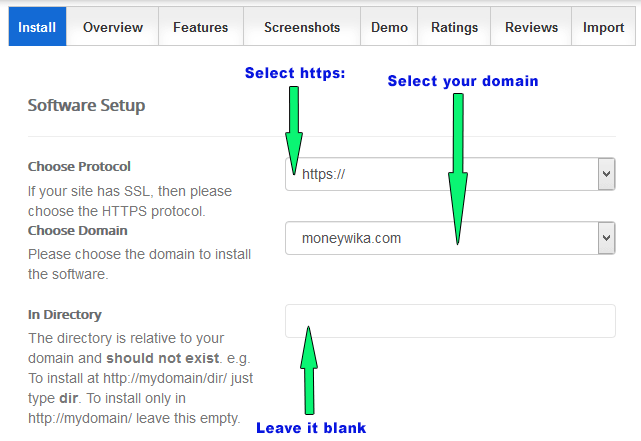 Note: To activate SSL certificate (green padlock in URL) follow these steps. 1: In the Search Panel(present at left, as shown below) search for “let’s Encrypt” and click on the tool. 2: Now under “Install new Let’s Encrypt Certificate” select your domain name. 3: Check the “ Let’s Encrypt Wildcard SSL ” option and click on the “INSTALL” button. Congratulations! now you have a valid SSL certificate. Search for a tool called “Softaculous” and click on it. Now move your mouse cursor on it and click “Install” button. On the next page, you will find some details about WordPress. Read it if you want & then click on the “Install Now” button. After clicking on the install now button, you will be taken to a page where you’ll have to enter the details of your blog. Do as mentioned in the bellow image. Now scroll down and enter your Site Name & Site Description. Now without making any further changes, scroll down and click on the “Install” button. WordPress will be installed with the default theme. You can view your site now. Now let’s install a theme and customize your blog. Enter the same admin username & password you entered while installing WordPress. Now you will be able to see your admin Dashboard. 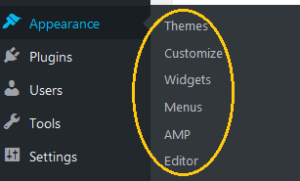 To install a theme, find “Appearance” menu, next move your cursor on it and click on Themes. Now click on “Add New” button. You will be redirected to a page with many free themes. Use the filter options above to find more themes. Now select the theme you want ad click on the “Install” button. After few seconds the theme will be installed. You can customize your theme the way you want by going to Appearance >> Customize. If you want a paid theme then visit StudioPress or ThriveTheme. The benefits of using paid themes are you will have many options & the themes will be optimized for SEO. This blog is using StudioPress theme. WordPress plugins are necessary to add extra features to your blog. 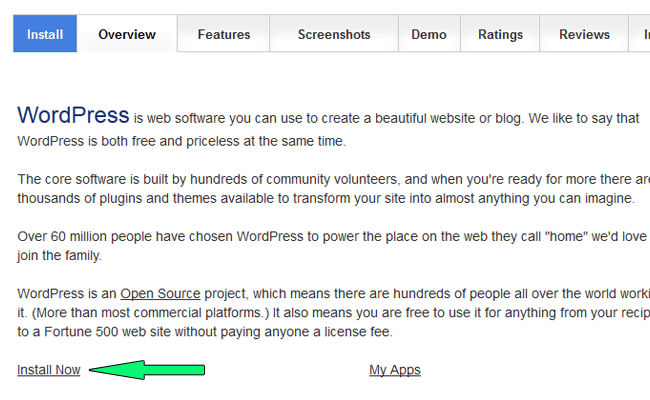 You can install a plugin by clicking on Plugins menu >> Add New >> Type plugin name >> click Install. After you’ve successfully installed your favorite theme & customized your blog, now it’s time to write some awesome content because “Content is the king!” for blogs. There are two types of content that you can add to your blog. Pages are static & they don’t require much change, they are linked to menus and footer. Example pages: About page, Contact page, etc.. You’ll only need about 2 – 5 pages on your blog. To create a page, move your mouse cursor on Pages menu >> Click Add new >> Type the Content & click Publish. Posts are generally called as blog posts and they are arranged based on their published date. For example, this page you are reading is a post. Try to write content that is readable & free from grammatical mistakes. You can use this free tool to find grammatical mistakes. Don’t try to copy content from other blogs because Google is very good at finding copied content and it will penalize your blog for doing so. To create a post, move your mouse cursor on Posts menu >> Click Add new >> Type the Content & click Publish. In blogging, SEO is the most important part when it comes to gaining free visitors from search engines like Google, Yahoo, Bing, etc..
SEO stands for search engine optimization, it is a technique used to rank pages higher on search engines. If you want a successful blog then learning SEO is a must, without it you won’t succeed. There are many concepts in SEO like on-page optimization, off-page optimization, XML sitemaps, Robots.txt, Backlinks, etc..
You will automatically learn about SEO when you start working on your blog. Use Google to find SEO tutorials. You can also view some free SEO courses on Udemy. Add your targeted keyword once in the title, description, headings and 4 – 8 times in the content. If you want to build backlinks then try to build from only quality sites. 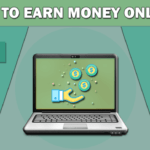 To start making money from your blog you need to monetize it with the suitable ad networks or affiliate programs. 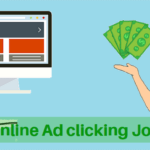 Google Adsense: Place Adsense ads on your blog to start making money. Affiliate Marketing: You can sell products relevant to your niche. ClickBank & Amazon Associates are the most popular among affiliate marketers. Sell ebooks: You can create and sell ebooks to your visitors. 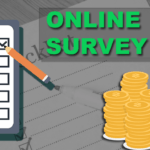 There are some other ways too to make money from your blog, they will be added here soon. So this post ends here. If you have any kind of doubt or if you need any help then you can contact me or you can commend below. And remember, only action leads to success. If you delay then it will become a habit so take action now.